The beach on the southeast coast of Little Ambergris Cay. 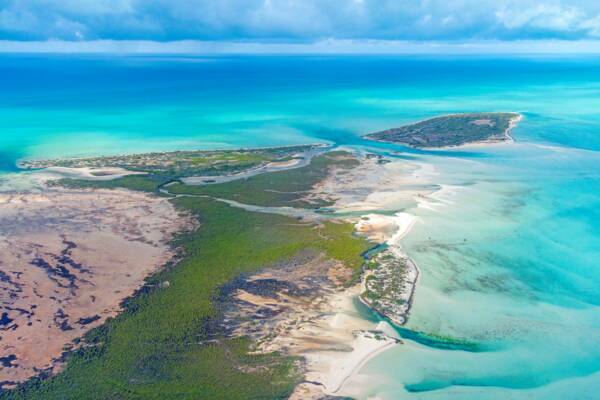 The uninhabited nature reserve island of Little Ambergris Cay in the Turks and Caicos. Little Ambergris Cay is an uninhabited wetland nature reserve island in the southeast Caicos Islands archipelago. 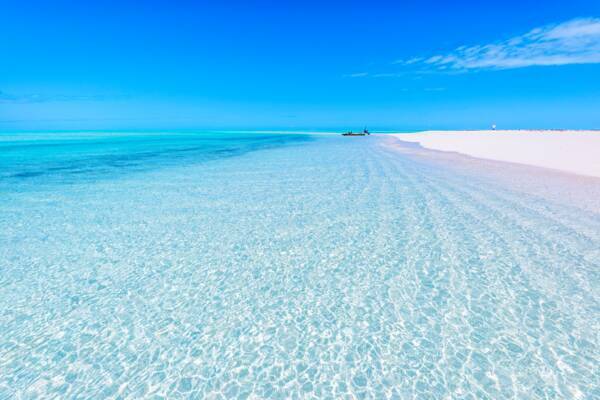 It’s located about one mile (1.6km) west of private island of Ambergris Cay (also known as Big Ambergris Cay). The cay has a rough area of around 1600 acres (650 hectares), yet much of this consists of red mangrove estuaries and tidal flats. Sand dunes line much of the windward southeast coast, which creates an exquisite beach. Little Ambergris Cay is surrounded by the shallow Caicos Banks, and the incredible turquoise water hues are truly breath-taking. To the west of the cay is a unique and scenic sand spit and sand shoal, which continues out with extremely shallow depths for more than 12 miles (19km). Little Ambergris Cay is quite important as a wildlife haven for bird and marine life, and the island, in conjunction with the Fish Cays which are located five miles (8km) to the northeast, form the Little Ambergris and Fish Cays Nature Reserve. The island also excels as a destination for kayaking, paddle boarding, eco-tourism, and as a stop for boat trips. Dues to its isolated location in the Turks and Caicos, those visiting will likely be from the private island retreat of Ambergris Cay, which is home to an all-inclusive resort and vacation homes. The exquisite beach at Little Ambergris Cay. Little Ambergris Cay is a very low elevation island, and the highest point is a 25 foot (8m) dune on the northeast coast. The island supports a beautiful and varied systems of sandy dune bushlands, and interior shallow channels. Birdlife, Turks and Caicos rock iguanas, bonefish, sharks, stingrays, turtles, conch, and more can be found on and around the cay. It’s interesting to note that 1879 when the island was being surveyed in relation to the purchase of adjacent Big Ambergris Cay, it was described as “composed of loose sand thrown up by the Sea, the interior being a swamp covered at flood tides and not worth the expense of a survey”. Today, the unique wetland environment of the cay is appreciated more! Last reviewed by an editor on 2 April 2019.